The struggle between mother and daughter continued, Evelina trying to get Susan to practice her piano and Susan resisting. Miss Alger, the piano teacher who had been staying with the Ameses, may have been relieved to return home. We might imagine that Susie was equally relieved to see her go. Mother and daughter rode together to take Miss Alger to her residence in the southeastern quadrant of Easton. After Miss Alger exited the carriage, did Evelina scold? Did Susie cry? How did the discussion go, or did they maintain injured silence? Or sidestep the topic altogether? The ride back to North Easton was long (and “rather chilly,” according to Old Oliver*), in no small part because Evelina and Susan stopped for midday dinner at the family farm, visiting Evelina’s mother, brother and family. It was late in the afternoon when they finally left, but nonetheless they stopped just north of the farm – would this be Alger’s Corner? – and bought some glassware for the house. They forked left onto Washington Street and stopped at the Morse Factory for thread and twine. A half pound of thread is a great deal of thread, if you come to think of it. Was the weight of a spool – or spools – included? The tumblers were what we would call drinking glasses today. 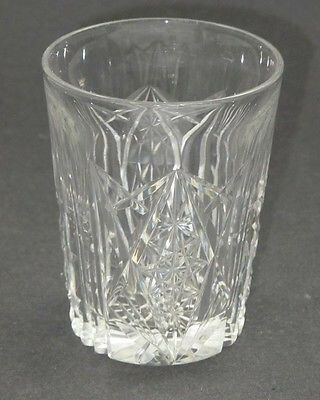 The term tumbler, of uncertain origin and now out of use, meant a flat-bottomed glass with no handle or stem. The tumblers that Evelina bought were most likely pressed glass, as opposed to hand-blown glass. The latter had been slowly replaced in the marketplace since about 1825.